While bitcoin may not be facing a “nightmare” scenario as indicated by the media, digital currency users are now paying higher-than-average fees and waiting longer for transactions to confirm due to an unknown disruptive network user. The incident has sparked a flurry of questions about the nature of the increased transaction load on the network as it comes amid the ongoing debate over scaling the bitcoin network. Known as the “block size debate”, the issue has fragmented the bitcoin community into two camps: Bitcoin Core, the network’s volunteer developers, who are seeking to change to how signatures are stored, thus increasing capacity as early as April of this year; and Bitcoin Classic, a contingent of developers and enthusiasts who have launched software that would more quickly force an update to the 1 MB cap on transactions they believe is an impediment to user adoption. At issue, is that when a user sends a bitcoin transaction, an extra cost is attached in the form of a fee. Effectively, bitcoin transaction fees serve as a way for users to bid to be included in a block, with that cost rising or falling with demand for space. Adding to the current problems is that a number of bitcoin wallets use a hard-coded fee amount: 0.0001 BTC (about 4 cents). Fees determine the priority that a transaction will receive as miners bundle them into the latest block. The higher the fee, the more priority it typically receives. Signs suggest that the commonly used amount, at least for the time being, may not be enough, which in turn is affecting wallets that are still using standard fees. The result is that some transactions with low priority remain unprocessed, which in turn is putting added pressure on users and businesses. Services like South American bitcoin exchange Bitex.la and peer-to-peer bitcion trading platform BitQuick are paying more in transaction fees, and observers are pointing to the situation as the scenario for the bitcoin network. 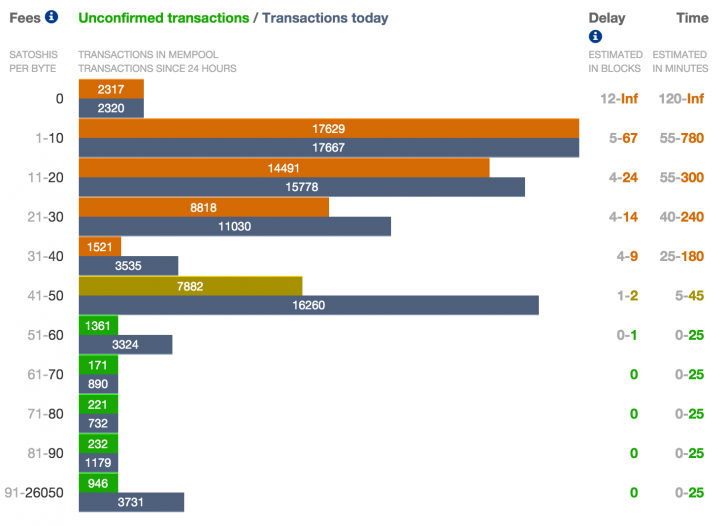 At press time, data from 21.co indicates that users paying the standard wallet fee of 10 satoshis per byte would have to wait between five and 67 blocks for transactions to confirm, a process it estimates could take as many as 13 hours. For more expedient transaction times, 21’s service recommends a fee of 0.0023 BTC, or about 97 cents, a 2,200% increase from the default fee. Talks with bitcoin wallet providers suggest that issues resulting from the current block capacity shortage are specific in nature. BitQuick CEO Jad Mubaslat said that his company is paying three to four times more than before for transaction fees, though the issues are related to receiving transactions rather than sending them due to the way that the firm computes fees. “More concerning is on the receiving side. We’ll have sellers have to wait [more than] 12 hours just to get their transaction confirmed so their order will go live,” he said. Bram Celeen, founder of Netherlands-based bitcoin exchange Anycoin Direct, said that some users of the service have seen disrupted transactions that are incoming – typically a result of paying low fees. Celeen said that, because Anycoin sells bitcoins prior to any transaction confirmations, the exchange is at risk of taking a loss should that transaction be rejected. Outgoing transactions, he added, have not had any issues. Of note, however, is it seems mostly hosted wallets are having problems. Both BitGo and Ledger offer wallets with a dynamic fee option, meaning users are able to respond in real time to increasing demand for transaction capacity. The situation has so far pushed at least one merchant to publicly declare its intention to stop accepting bitcoin given the risk of having transactions get stuck. Nottingham-based micropub The Barrel Drop said in a Reddit post that it won’t accept bitcoin payments “while there is such a high probability that transactions will not confirm”. The micropub indicated that it would resume taking bitcoin once the situation is resolved. The bitcoin network has been on the receiving end of spam attacks during most of its history, including spam events last fall that were revealed to be the work of an entity called CoinWallet that claimed it was seeking to showcase capacity issues on the network. Yet this week’s occurrence appears to be of a different sort, involving a string of transactions with relatively high fees – something that appears to be pricing out users who are using hard-coded fees that, as a result, leaving them at a disadvantage. Certain industry representatives interviewed were also split on whether to call the new transactions ‘spam’ due to the fact that identifying the nature of the activity is difficult. Justus Ranvier, a contributor to the Open Bitcoin Privacy Project, which aims to assess the privacy featured offered by bitcoin wallets, said the transactions could be coming from a badly designed exchange wallet or a malicious attack “designed to sway the block size debate”, but that there is no way to tell definitively. Avalon’s Yifu Guo told CoinDesk that he believes the effort may be an attempt to tumble coins – or obscure the transaction history of funds by mixing them repeatedly. A video posted to YouTube further illustrates the activity, further supporting the idea that some individual or group is pushing up overall network fees through a stream of transactions. However, he noted the fact that the transactions seemed to be using a “poor and outdated” method for tumbling coins that didn’t seek to provide privacy. “The only thing it does on the network is increase load,” he said. 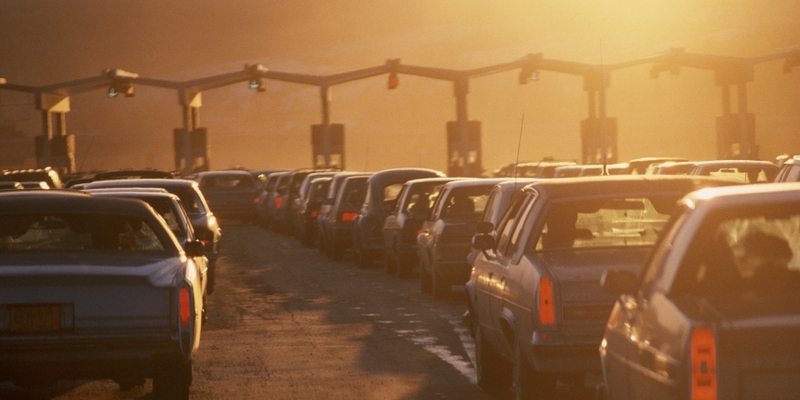 Network data suggests that the congestion problems caused by the payment of low fees may be subsiding – possibly as a result of higher fees being paid by network participants. According to TradeBlock, the size of the bitcoin network memory pool, which contains all the transactions awaiting inclusion in the next block, has shrunk from more than 50 MB on 1st March to roughly 19 MB at press time, constituting roughly 15,000 transactions totaling about 77,000 bitcoins. Yet the incident raises the question of whether wallet software should be programmed to allow for dynamic fee adjustments. BitGo software engineer Jameson Lopp told CoinDesk that if these kind of mechanisms were more common, fewer users might see stuck transactions – but that fees would likely rise as a result. Pete Rizzo co-authored this piece.